Growing up in Queens, New York, Jam Master Jay of the legendary group RUN DMC put him in the game. With an engaging New York accent, laid-back style, and intensive communication skills, Lobel, began picking up on the ins and outs of the music industry thru RUN DMC’s success. Slowly but steadily, he made his rounds in the music industry. 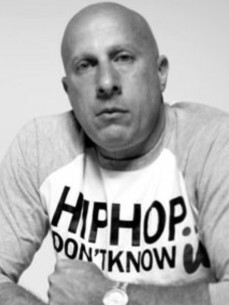 After making a name for himself, he got a job at sony /Relativity Records as an A&R and worked with Fat Joe, The Beatnuts, frankie cutlass , MOP, Common Sense, Fatal from the Outlawz, 8 Ball and MJG, and 36 Mafia , eazy e’s ruthless records , tony drapers sauve house records , Lobel soon met Eric ‘Eazy-E’ Wright, which led him to meet, then 16 and 17-year-olds, Bone Thugs n Harmony. With the skills, connections, and knowledge he had put into the industry, he put his energy into the group, and in return they became one the most prominent icons in the Rap Game today. Lobel was the dominant force behind much of their success with the work put into their projects: LP’s, solo projects, the Mo Thugs! projects, and the collaborative projects with Bone and other artists: Mariah Carey, Biggie, Tupac and BIG Pun, chamallionaire , phil collins , akon , the game and ty $ and is still with the group 20 years later because of his loyalty . Lobel has won 2 grammys and 2 american awards as well other awards . His success has led him to countless areas within the entertainment industry including Millionaire Matchmaker in 2013 and 2014 and in 2005, Missy Elliot called upon Lobel to join her UPN hit show, “Road to Stardom,’ where Lobel, no actor, portrayed his real personality and showcased what’s prevalent to the fast-paced realities within the music industry. He’s also been called upon from numerous high schools , juvenille halls and colleges throughout the country to inspire students through motivational speaking where he shares his knowledge about the music industry, different situations he’s had to deal with and work through, and how to become successful and real life issues Among other activities, Lobel has engaged in numerous DVD’s including: I Tried, Death Before Dishonor, Two Turntables and a Microphone, and Outlawz: Worldwide & Rap Sheet. As listeners sit back and take conscious observations of Hip Hop today, it can unmistakably be understood that the music has grown internationally. Currently, Lobel has teamed up with pop sensation Sean Kingston and are partners with J.R. Rotem and Warner Brother Records with Kara Dioguardi, and with the focus on the achievements of their first artist IYAZ thru there label together TIME IS MONEY. Lobel is also managing Mann, signed with A2Z Entertainment/ Beluga Heights/ Mercury / Island Def Jam Records, and partnering with Big U, he manages another West Coast artist Nipsey Hussle, who is signed to Sony/Epic Records. With Lobel’s ability to stay current, and leap into the up and coming success of new artists, Lobel’s undeniable sense of what’s going to be big helps him to stay on top of the game. Lobel has worked with numerous industry executives, artists, and producers. He’s done it all within radio, retail, street promotions, club promotions, and marketing, and as the industry spirals into a complicated and controversial roller coaster, Lobel is able to maintain his status in the game because he relies on only himself to get the job done; he stays humble and loyal with integrity in doing it. Working hard for his own success, Lobel has respect for those who’ve worked hard to deserve their spot at the top. ‘You got to climb the ladder, and I respect those who do. It takes patience and sacrifice to become successful.’ The future for Steve Lobel is to continue with his success: the coach lasts longer then the player, always, and he’s the coach.’ He is a man about business, all while staying loyal to the game. Those from Mariah Carey to Russell Simmons can tell you he’s one of the hardest working individuals in the music industry, and his work and accomplishments shown to be relevant with the music industry today. He’s a dinosaur… but his really fossil fuel because he stays innovative, creative and relevant. With Lobel’s ongoing effort in this industry and dedication to the music, the world of the industry will continue to take heed to his work and come to understand how he’s A2Z…..he also is writing his book titled ” the coach last longer than the player and he also has his weekly radio show ………!thru dj skee network DASH with dj kiss called the odd couple. He also works with 11 year old dj kiss …! And has his talk show thru complex media called livewiithstevelobel as well !